As a former educator, U.S. Congresswoman Stephanie Murphy is pleased to offer internships and fellowships to eligible high school and college students to enhance their academic experience and learn more about the legislative process and the U.S. House of Representatives. These highly competitive internships are available in the Orlando, Sanford, and Washington, D.C., offices each spring, summer, and fall semester. Preference will be given to students either from or attending school in Florida’s Seventh Congressional District. Paid full-time internships: only available in the Washington, D.C., office during the summer. Interns can expect to earn $15 per hour, work 28 hours a week, and may receive reimbursement for metro transit commuting expenses up to a certain amount. Interns will meet weekly with Congresswoman Murphy and are expected to use one day a week to experience the multitude of various learning opportunities and experiences available in the nation’s capital. Paid full-time digital fellowship: only available during the summer in the Washington, D.C., office. Fellows can expect to earn $15 per hour, work 35 hours a week, and may receive reimbursement for metro transit commuting expenses up to a certain amount. For academic credit only (FACO) internship: available year round in any office and strictly reserved for eligible currently-enrolled high school or college students who will earn college credit as a result of their internship. FACO internships are unpaid, but FACO interns may receive reimbursement for metro transit commuting expenses up to a certain amount (transit benefits available only in DC). Full- or part-time opportunities are available depending on availability. Interns will be on time each day and participate fully in the activities of the program. They expected to secure their own housing during the program and cover all other expenses, such as meals and clothing. Interns may request days off work, although those requests may be denied and are certainly discouraged given the brevity of the program. Interns will inform the staff immediately if illness or emergency circumstances necessitate one’s absence from the office. Interns will dress professionally at the office and will serve as positive representatives of the office in all their conduct, both in and out of the office. Interns will be treated as members of the staff, and they are expected to maintain an appropriate level of confidentiality, particularly related to information about constituents who contact the office. The office’s strict anti-discrimination and harassment policies designed to protect workers and ensure a safe, inclusive work environment will fully apply to interns. Any intern who violates the office’s policies or code of conduct may have their internship immediately terminated. Spring & Fall Semesters: Applications will be accepted and considered on a rolling basis as they are received. Flexible dates depending on class schedule negotiated with the internship coordinator. FACO internships are strictly reserved for currently-enrolled high school or college students. Internships are merit based and applications are chosen based on academic performance, writing samples, and letters of recommendation. All interns are expected to help answer phones, respond to constituent mail, greet constituents, and provide general support to the staff upon request. 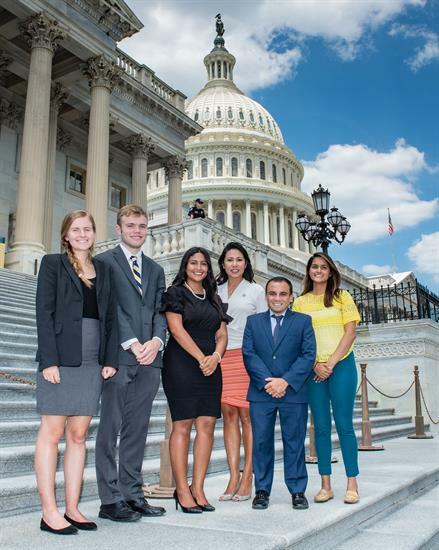 In addition to the duties mentioned above, Washington interns are also expected to help arrange and give U.S. Capitol tours to visiting constituents; attend legislative briefings, hearings, and markups at the staff’s request; complete weekly reading assignments; and meet weekly with Congresswoman Murphy to discuss current events and the inner workings of Congress. In addition to the duties mentioned above, the Orlando and Sanford interns are also expected to help the Congresswoman's constituent advocates, help coordinate and staff district outreach events, help staff district events with the Congresswoman, and meet weekly with the Intern Coordinator. Are any of the internships paid? Due to a recent change in federal law, starting in 2019, we are pleased to offer a limited number of paid internship opportunities available for the Washington, D.C., office only. Additionally, we offer one Digital Fellowship in our Washington, D.C., office designed for college students or recent graduates interested in digital communications and social media. The digital fellow’s responsibilities will include drafting and creating social media content, producing high-quality web graphics and videos, taking photos, filming and livestreaming events, compiling daily press clips, and maintaining media lists. Candidates must possess strong technical skills and knowledge of the Adobe Creative Suite, as well as advanced creativity and artistic ability. Experience in website management, photography and social media strategy a plus. All interns will be paid on the same schedule as House employees, which is on the last day of each month. Are there any other resources or scholarships available? Start with your school’s counselor who might have the best ideas! Submit a completed application through this website along with a brief cover letter, resume, two writing samples, and two letters of recommendation by the deadline to the intern coordinator. Only online submissions will be accepted. Please do not mail or drop off your application in person. Ready to apply? Please complete the form below! If yes, in what state and district? If you answered yes to any questions mentioned above, please explain and include the dates of the actions in the space below.